A Chinese-U.S. research team is exploring the use of metamaterials -- artificial materials engineered to have exotic properties not found in nature -- to create devices that manipulate sound in versatile and unprecedented ways. 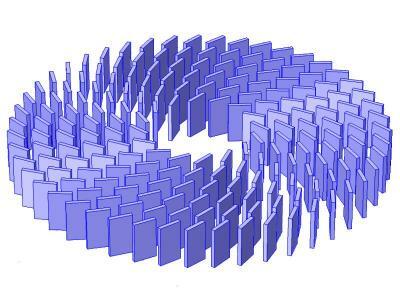 In the journal Applied Physics Letters, the team reports a simple design for a device, called an acoustic field rotator, which can twist wave fronts inside it so that they appear to be propagating from another direction. "Numerous research efforts have centered on metamaterial-based devices with fascinating wave-control capabilities such as invisibility or illusion cloaks," said Jian-chun Cheng, a professor at the Institute of Acoustics, in the Department of Physics at Nanjing University. "An acoustic field rotator, however, which can be [considered] a special kind of illusion cloak with the capability of making an object acoustically appear like a rotated one, doesn't exist yet." Field rotators for electromagnetic waves and liquid waves have already been demonstrated and show promise in their respective areas, but "another important type of classical wave, an acoustic wave, is a much more familiar part of our daily lives and could find applications in a variety of situations," Cheng noted. Cheng and colleagues designed what they believe to be the first feasible acoustic rotator model and also fabricated a prototype to validate it. "We were surprised to discover that by using metamaterials, acoustic waves can be rotated in a manner similar to their electromagnetic or liquid wave counterparts -- so sound has finally joined the club," Cheng said. Another surprise the team discovered was that acoustic and electromagnetic rotators can be designed based on the same principles. In this case, the researchers used anisotropic metamaterials, which possess physical properties that differ along different directions. "It's much easier to implement highly anisotropic acoustic metamaterials than electromagnetic ones, and an acoustic rotator may provide even better performance than its [electromagnetic] counterparts," said Cheng. The team hopes their acoustic rotator, with its ability to freely manipulate acoustic wavefronts, will improve the operation of devices like medical ultrasound machines, which require the precise control of acoustic waves. The ability to rotate the sound waves could improve the contrast of ultrasound devices and allow them to image damaged tissue or diagnose diseases in ways they currently cannot. This is significant because ultrasound devices may be cheaper than other imaging modalities and do not use X-rays. What's ahead for the team now that they've shown the possibility of building an acoustic rotator by exploiting acoustic metamaterials? "We've fabricated the simplest proof-of-concept device, which at this point can't serve as a mature and practical device, so it's worth further improvement and optimization," said Cheng. In the future, acoustic rotators could "serve as useful building blocks for constructing more complex structures with richer acoustic manipulation functionalities, if properly combined with other kinds of components," he added.